Susan snapped the following picture yesterday when I had the privilege of having the largest number of members of my family at our house for a laidback afternoon of burgers and conversation. There was my mother Casey, my daughter Katie, and my grandson Aiden — all of us together with my cousin Margaret from Nashville who is here visiting Casey. Four generations. Great grandmother, granddad (cough! ), daughter Katie and grandson Aiden. Here’s Grandpa (cough!!) 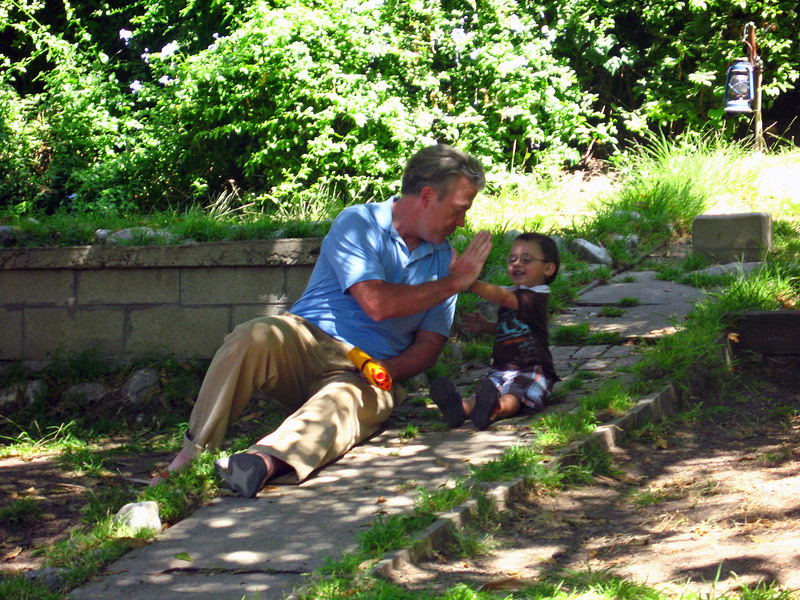 and grandson in the backyard high-fiving after successfully hitting our target with a Nerf dartgun. Who knew that the weapon, purchased to discourage a stubborn pair of pigeons from nesting under our eaves, would lead to this awesome moment, captured by my beloved wife. This entry was posted on Sunday, July 10th, 2011 at 5:55 pm and is filed under family. You can follow any responses to this entry through the RSS 2.0 feed. Both comments and pings are currently closed.